Updated Wednesday May 30, 2018 by SLL. Can someone volunteer in the concession stand? Anyone? Bueller? Thanks to donated labor from a coach and parent of two Smithfield Little League players and donations from a local home improvement store, convincing parents to volunteer at the Lou DiNoble Field concession stand just got a little bit easier. 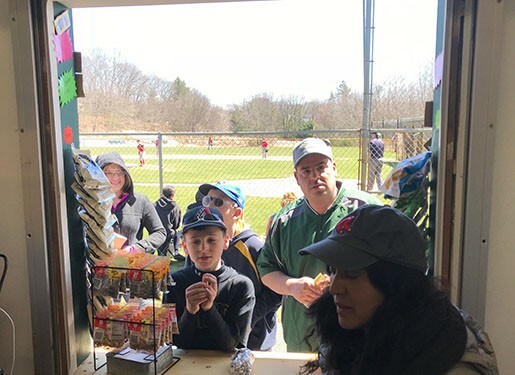 During Majors and AAA games, parent volunteers from the teams in action are asked to staff the concession stand, a critical source of revenue to support league operations But in recent years, Smithfield Little League team managers have struggled to secure volunteers.. The challenge was not a lack of willing individuals. Rather, due to the positioning of the service window that faced away from the field, serving in the concession stand made it nearly impossible for parents to watch their kids play baseball. Following years of discussion by the league’s Board, new Board member and concessions coordinator Shanyn Turner, put a hope and dream into action. Turner marshalled local resources to move the window so that it now faces the field enabling volunteers to watch the game instead of a grassy area and parking lot. She appealed to Louis LaPorte (pictured at right, with his sons), a longtime Little League coach, and local contractor, asking him if he would be willing to perform the necessary renovations to move the window. Without hesitation, LaPorte agreed to take on this project. Work began in early April and quickly progressed. Recognizing the need for additional storage and food preparation space, Turner then appealed to the Smithfield Home Depot (Store #4282) seeking a donation that would fulfill those needs. The local Home Depot responded with a set of base and wall cabinets, as well as a new countertop valued at more than $500, providing ample storage space. LaPorte, Turner, League President Shane Moore and LaPorte’s two sons were on hand to participate in a ceremonial ribbon cutting to officially open the concession stand for the 2018 season on April 20. The event was attended by nearly a hundred Smithfield Little League players, their families and Board members.